The prime objective of the scheme is to enhance the reach of welfare schemes of Government and fill the gaps in service deficient tribal areas, in the sectors such as education, health, drinking water, agro-horticultural productivity, social security etc. through the efforts of voluntary organizations, and to provide an environment for socio- economic upliftment and overall development of the Scheduled Tribes (STs). Any other innovative activity having direct impact on the socio-economic development or livelihood generation of STs may also be considered through voluntary efforts. 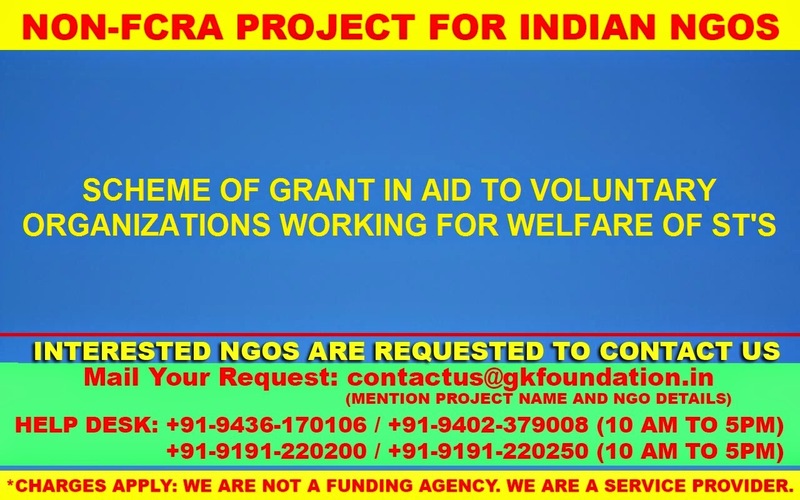 Any registered voluntary organization (VO) / non-governmental organization (NGO) engaged in the conduct and promotion of social welfare of STs. The organization should have been registered for at least three years. Institutions or organizations set up by Government as autonomous bodies either under a statute or as a society registered under the Societies Registration Act, 1860. A Public Trust registered under any law for the time being in force. The trust must have been registered for at least three years. Experience of at least three years in the relevant field. Aptitude and experience in welfare work pertaining to weaker sections. The location of the project proposed by the organization in service deficient tribal areas. Preference will be given to programmes that benefit the Primitive Tribal Groups or naxal affected aareas/remote/interior/backward areas notserviced by Government Institutions or other established NGOs. Financial viability of the organization to contribute its share, and ability to continue the work for limited periods in absence of assistance from the Ministry. Networking with other institutions for optimum utilization of resources allocated and assets created.